It is illegal to release your vessel's blackwater when in Penrose Island Marine Park. Please respect this marine park and contain all blackwater when anchored here! This park's land includes an attractive archipelago of small coves and narrow channels, excellent for kayak and dinghy exploration. The excellent anchorages and interesting beaches provide ideal conditions for nature viewing, diving and fishing. There is a network of narrow channels and sand and white shell beaches along the southwest shoreline. Scuba diving, kayaking, and fishing are popular pursuits. Park Size: 1,079 hectares of marine area and 934 hectares of land area. Parts of this park are exposed to the winds and weather of the Pacific Ocean, especially when the wind is blowing from the southwest. Listen to broadcasts of marine weather forecasts and warnings, and do not venture onto the outer coast in small boats, dinghies or kayaks during stormy weather or after storms when swells can remain high for days. Do not harvest clams or other bivalves. The entire coastal area including this park is closed to harvest of bivalves due to the presence of red tide, which can lead to paralytic shellfish poisoning. This park is used by the Owikeeno Nation for traditional shellfish gathering. Mariners must use their own holding tanks while visiting the park. Penrose Island Marine Provincial Park is 86 km north of Port Hardy at the entrance to Rivers Inlet and the south end of Fitz Hugh Sound. Refer to Canadian Hydrographic Chart 3921. Enter from Klaquek Channel into sheltered anchorages on the east side of the island. Access is by boat only. Rivers Inlet is the nearest supply centre. There you can purchase gas, diesel and supplies. History - This park was designated in 1982. Cultural Heritage - The park is in the traditional territory of Oweekeno First Nation. Wildlife - As you cruise through the waters near the park, watch for orcas, humpback whales, Pacific white sided dolphins, sea lions and other marine mammals. Enjoy identifying the weird and wonderful creatures of the intertidal zone when the tide is low - sea cucumbers, nudibranchs, chitons, sea stars, molluscs, urchins and multicoloured algae. Please look, but do not disturb them or move rocks. On shore, watch for Columbia black-tailed deer, mink and wolves. The beaches and rocky shores offer excellent bird watching opportunities - oyster catchers, sandpipers, pigeon guillemots, scoters and of course bald eagles. This area is prized by sports fishermen for salmon and rockfish. Anyone fishing or angling in British Columbia must have an appropriate licence. The entire coast is closed to bivalve (i.e. mussel and clam) harvest due to the risk of red tide, which causes paralytic shellfish poisoning. This park is open to hunting. Please refer to the British Columbia Hunting Regulations for more information. Wilderness, backcountry or walk-in camping is allowed, but no facilities are provided Camping is permitted, but it is preferable to sleep aboard your boat if possible, as this has less impact on the environment. 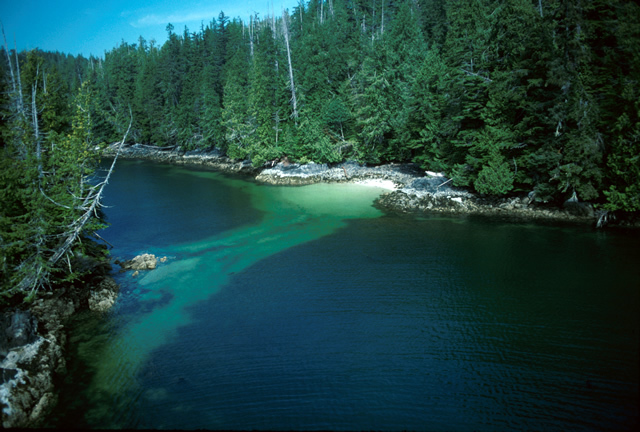 Suitable sites above the high tide line can be difficult to find because of the thick undergrowth of the coastal forest and rocky shore. If people camp, they usually tent on the beach at Clam Bay.